The BIOEN, FAPESP Bioenergy Research Program aims at articulating public and private R&D, using academic and industrial laboratories to advance and apply knowledge in fields related to ethanol production in Brazil. Division of Research on Impacts: Social and economic, environmental studies, land use, intellectual property. The BiIOEN Program has a solid core for supporting academic exploratory research related to these topics. It is expected that these exploratory activities will generate new knowledge and form scientists and professionals essential for advancing industry capacity in ethanol related technologies. 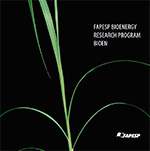 On top of this, the BIOEN, FAPESP Bioenergy Research Program establishes partnerships with industry for cooperative R&D activities between industrial laboratories and academic laboratories at universities and research institutes, which are to be co-funded by FAPESP and industry. For these collaborations the details for each theme are specified agreementing to the interest of the private partners and to FAPESP commitment to fostering research in the State of São Paulo. Other research agencies from federal and other state governments were invited to participate in the BIOEN Program: the Ministry for Science and Technology and Fapemig declared its interest and other agencies are studying their commitment.